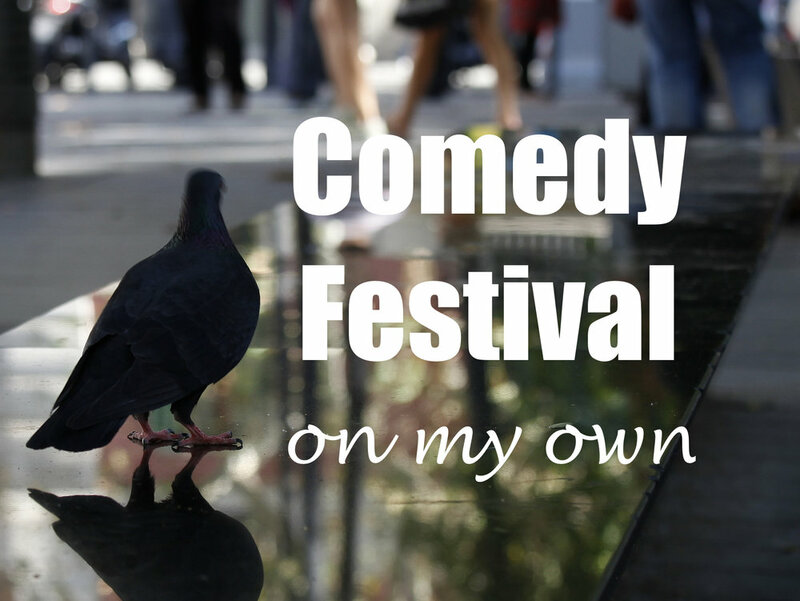 The other night I went on a date to see some comedy at the Comedy Festival, and the person I took was myself. I don't go out on my own very often - not unless you count going to the park at lunchtime, and I don't think that really counts. Dave was away and I was slurping some ramen after work, and I took out my phone and my credit card and booked myself a ticket to a show in one hour - just like that. It was the most decisive thing I've ever done. I considered complicating the affair by inviting a friend or a sister. But I decided that no, I needed to keep this one simple. I walked along the Melbourne streets, huddled up in my boots and jacket and tights. I liked that feeling, and I liked the fresh autumn air on skin, cool as the twilight turned into night. I noticed the feeling inside of me too, which felt a little bit like being hungry, even though I had just eaten a big bowl of noodles. It was my familiar aloneness-hunger feeling, that I only really get now when Dave's been away for a week or so. I quite like this feeling, too. It's such a human thing to feel alone, and so in a funny way it makes me feel connected to the people around me. These days I'm not so desperate to sate my aloneness-hunger. We filed into the venue, and of course I saw somebody I knew. I thought, "Yey, a friend!" and also, "Oh no she will think I'm a loser because I'm by myself!" I tapped her on the shoulder and we said a slightly awkward hello. I saw an empty seat on the edge of a row. I said to the lady sitting next to it, "Can I sit here?" and she said that was ok. I asked the lady if she could hold my plastic glass of of red wine while I took my coat off, and she stopped talking to the man on her other side so she could help me out. I sat down. The comedian came on stage and the show began. I felt the closeness of the couple on my left, and the cavern of the empty isle on my right. I felt the presence of my friend and her friends over the way, and I noticed the guy sitting in front of me, who was also alone. I felt the wholeness of the group who had gathered to listen to someone being brave and to be pulled outside of themselves and to laugh. Eventually I stopped feeling alone, and felt part of this group, which existed for this one moment in time only. The show ended and we flowed back out of the building to meet the night air. We joined a great pulsing gathering of people, who had come to be together on the streets of Melbourne that night. I wandered home to bed, still feeling a little hungry, but quite happy.